SkyCrashesDown: I found this hard to read with all the sections out of order, so I rearranged them a bit. This is the first game played on Wiki that I've read through, so I'm not sure what standard practice is -- hope this is alright, though. HolIgor: I don't play with BlueWyvern, so I'll take this. HolIgor: White 2: This is what I play recently when the opponent plays komoku. Recently means after I've read Kawabata's "Meijin". 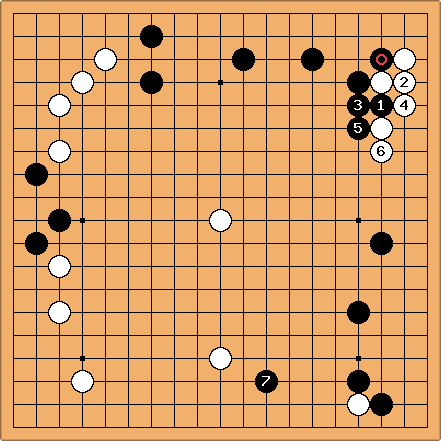 This is the move that Honinbo Shusai played against Kitani Minoru. I've analyzed some of my games with Kombilo and was surprised to find out that these are among the most popular two first moves in my games, though in most cases Black plays hoshi against me. I do quite well with this komoku, so I don't see any reason to deviate. Scartol: Black 3: I like to have one komoku and one hoshi in my opening; I'm trying to develop my strategies for defending them each. HolIgor: White 4: While White 2 was for territory, White 4 is for speed and influence. Actually, I did not decide yet which I want in that corner. Normally when you play hoshi, both options are open for some time. So far I did not actually pay attention to what Black did. I marked my presence in two corners. A multi-purpose fast hoshi in one and more territorial komoku in another. Scartol: Black 5: Trying to set up a right-side base. 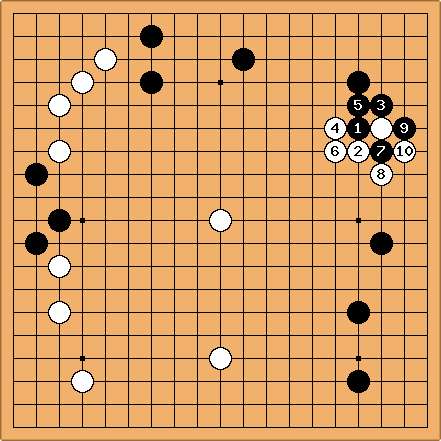 HolIgor: Black 5: This move creates a one-sided formation that is called the low Chinese fuseki. If you read through these pages you'll see that people hate to play White against Chinese fuseki (low or high). The move, therefore, is very good. On the other hand you've tricked me by playing your first move as komoku and your second move as hoshi. If I knew that you'll be playing Chinese I'd choose hoshi as my move in the lower right corner. But your unusual sequence put me off guard. The purpose for that is my way to cope with the Chinese fuseki, which works better with two white hoshi. HolIgor: White 6: Let's try to follow the same path with komoku in the lower left corner. The lower side is the most important area now, because White wants to stop Black's future propagation from the lower right corner. But what move on the lower side to choose? People play a, b, c or 6. 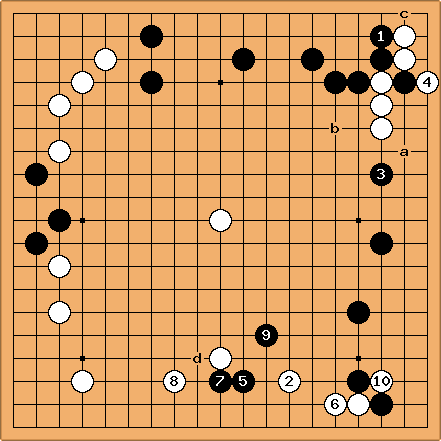 White 6 is a very mild, distant approach, neither strongly confining the opponent nor building a stronghold. Scartol: Black 7: Part of me says I should respond to your approach on the bottom, but the stronger part says I should stake a claim on the top. I'd hate for you to strike there, and thereby proclaim 2/3 of the board as your sphere of influence. JamesA: Sorry, I just wanted to make one comment. Black 7 should definitely be played one to the left of where it is. Black and White each have a star point stone on the top. If Black is going to play around the middle of these stones, he should play exactly in the middle. As it stands, White could play two spaces to the left of 7 and Black will have gained no advantage from playing first at the top. Holigor: Everybody is welcome to make comments. It is a teaching game. I agree with the above comment. It is useful to remember. I understand that my opponent wanted to play tighter to his corner. But one has to try to make moves with multiple purposes. 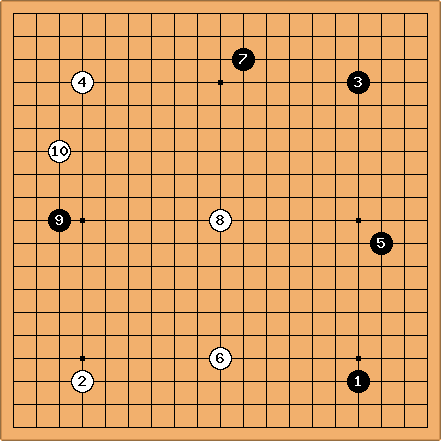 HolIgor: White 8: This is the plan of my method of playing against the one-sided formations (as expained on BQM 386). If White plays on the right then Black's move in this region creates a moyo that is too large. Scartol: Black 9: Well then, do I really have a choice but to invade here? HolIgor: White 10: This move gives some support to the hoshi stone at the top. The idea of the early tengen was to create some support to the invasion on the right while making the moves on the left more urgent for the opponent. Scartol: So was it premature (or foolish) to invade? Black 11: I figure sneaking under and making the top wall for a base are miai. HolIgor: Black 11 was very unexpected. There is an open space in the direction to the bottom and an extension there was expected. It would establish some base aiming at the lower right corner at the same time. Black 11 does not reach that objective and at the same time it does not attack White's stones significantly. It can be ignored. Holigor: White 12: Until the black group is settled, White can play on the right. This move puts a mild pressure on the black group and at the same time expands from the lower corner. Bill: Mild? Gee, HolIgor, I'd like to see severe! ;-) White 4 would have been mild. JamesA: As a slightly tangential point, I do like your idea of playing tengen against the Chinese, HolIgor. I think I'll try it in some of my games. Hurrah for Sensei's Library! Scartol: I worry that if I make large moves like the extension toward the bottom (for Black 11), I will overextend myself. Black 13: Trying to survive. HolIgor: Getting thick at the bottom and making a shimari simultaneously. Scartol: Black 15: An attempt to threaten and expand. Gorobei: I'm just a novice, but Black 15 seems to help White solidify the upper-left, while not really threatening much: the left black group is still in peril and saving it will let White make good space in lower-left/center. HolIgor: It is decided now. White has to go for the territory in the corner. Scartol: Black 17: Protecting my influence at the top. Scartol: Black 19: Is it too early to start settling this group? I also have an ulterior motive in mind.. Of course, now that I've set it down and look at the board, it strikes me as another very passive move.. Compare how the board would look if White had played there instead. HolIgor: White 20. This is the remaining invasion point. Scartol: Black 21: Defending the top. Maybe I need to be more proactive? HolIgor: This move was purely defensive, you connected your stones but the corner is open yet. Bill: "Defending" is almost a dead giveaway. :-) Normally Black 21 is OK, but here Black is overconcentrated on the top side. You need to put pressure on the White 20 stone. This is a common pattern. Because of the marked black stone, White cannot make an ideal extension. White is a bit overconcentrated, but so is Black, and Black still has a weakness at a. The Attach-block (attach and block) is a good attack here. Again Black avoids overconcentration and does not give White a good base. If White connects at 7 instead of 6, Black cuts at 6. HolIgor White 22: Testing intentions. Scartol Black 23: 'Attach, hane' is how the saying goes, right? HolIgor: Correct, hane is a good move here, but Black had a number of options to consider. HolIgor: Black 24: White wants to settle at in this corner. Black's top is so thick that attacking it is a difficult task. Making it even stronger is not a great loss. Scartol Black 25: I can't have you moving in on my upper moyo, now can I? HolIgor: White 26. I continue with my plan of settling in this area. Naturally, I expect Black to resist. Black makes profit and puts pressure on the white stones. The profit here is not the main thing. It is more important to resist White's attempts to get life easily. Scartol Black 27: Sounds like you're recommending that I attack your invaders. Normally I would play at a, but in light of your comments I'll be more aggressive. Bill: Black 27 at a would be very bad. 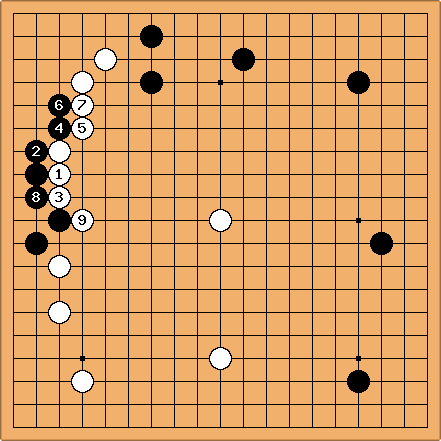 Black 27, although more aggressive, strengthens White while leaving Black weak. The following is better. 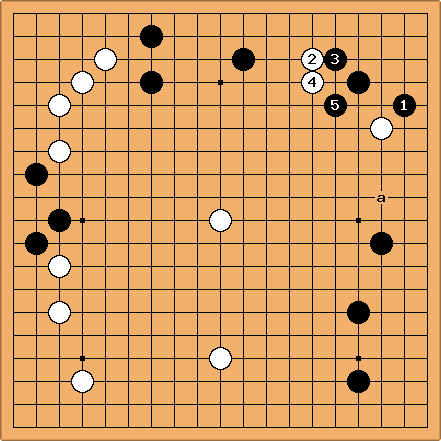 Black 1 - 5 forces White into a low posture while buiding a wall that works with Black's stones on the top. Saving the marked stone is small at this point. Taking sente, Black shifts to the bottom. Black 7 extends Black's moyo and threatens to invade White's. HolIgor: White 28. Naturally I pull out the stone. Interesting, I expected the joseki shown by Bill. But a deviation from it creates a situation that I've never played. HolIgor: I am not sure, but I've seen it played by strong IGS players so many times that I thought it was. Scartol Black 29: I don't expect to win any nominations for "Most Aggressive Move of 2002", but I've been told I'm weak at the top, so I figure I should reinforce. Maybe I can muscle my way into the center a bit here. The more I look at it, the stupider it looks, but I'm a big fan of the "no take back" rule..
Bill: Black 29 is a thought, but a or b is better. :-) Black 29 does not protect the cut at b.
HolIgor: White 30. Compare now this situation with what was suggested by Bill. The white stones are higher, Black did not get the wall. Scartol: Your point is well taken. It appears now that, unless I want to compound my folly, I had best protect the upper region as best I can. Thus, Black 31. Bill: Black's upper region is fine. Black 31 does not threaten White's group, and is, at this point, small potatoes, merely saving one stone and adding a few points to Black's territory. Better to take sente. As for compounding folly, adding a stone does so more often that playing elsewhere. HolIgor: White 32: White is not 100% alive in the top right corner but a rash attack on that group will favour White. So I take an oba. By the way I am convinced that double digit kyu players always lose too much because of small moves. 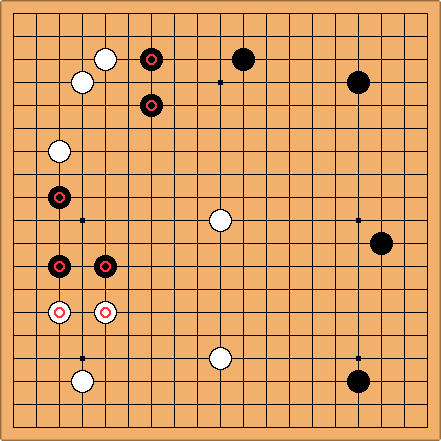 Once they learn to see that the local loss is small and gote for the opponent their score on the board improves a lot. Black 33: Trying to extend my moyo as much as possible. I thought about playing at a, but it felt like I was overreaching and could be cut off. Bill: Black 33 is a good play. :-) a is overextended and too low. 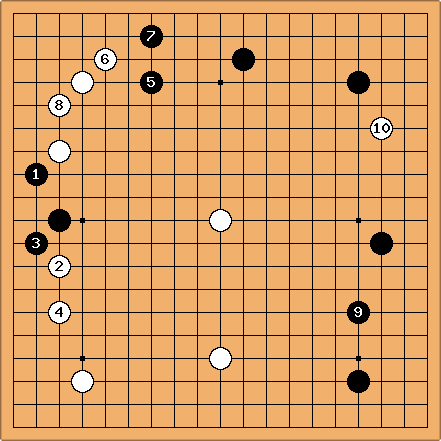 Besides extending your moyo, Black 33 puts pressure on the White group in the corner. As HolIgor points out, it has not formed eyes yet. Still, reducing White's bottom left moyo was urgent. How to go about doing so is a difficult question. As for whether a move is necessary or not, when in doubt, play elsewhere (tenuki). If you are wrong, let your opponent show you your error. ;-) If you make an unnecessary play, it will not always become clear that it was wrong. By the way, playing tenuki whenever it might be right is one of the training exercises of apprentice pros. HolIgor: White 32 was a mistake. The correct way is to play urgent moves before big moves. I allowed myself to be forced. White 34 seems to be the shortest way to life. Bill: Life is not the only consideration. b or even c is better, no? Scartol Black 35: An attempt to reduce..
HolIgor: White 36: First saving a stone, then I will decide what to do with the invader. Scartol Black 37: I feel like Martin Bishop in Cosmo's office in the movie "Sneakers"..
HolIgor: I like to attack from far. Actually, I don't like moyos. Neither the opponent's nor my own. Scartol Black 39: I wish I could feel that way. I like having a moyo, and I feel violated when my opponent invades. I need to lose that thought pattern..
Bill: : Refusing the invitation. Better hane at d.
HolIgor: White 40. I am cut off, so there is a need to survive. Generally, building a framework requires skill in attack. This is my weak point, so I prefere to play small scale.